The Symphony #4 in B minor by James Domine subtitled Gothic was completed in February of 2012 although sketches for the piece date from a considerably earlier period. Cast in four movements, Prelude, Toccata, Passacaglia, and Thema fugatum, the entire piece is based on a single theme that is used in various permutations throughout. The character of the piece in its entirety can be described as a mystical journey into an imaginary landscape that is at once curious, intriguing, beguiling, and sometimes frightening. The subtitle for the symphony derives from its relationship to the poem entitled The Gothic Ancestor which is given below. 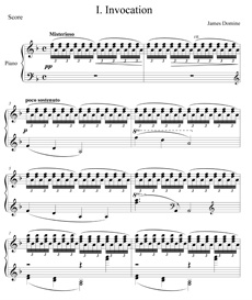 The first movement was originally presented as Sonata #4 for piano solo and represents a fundamental working out of the principal melodic ideas contained in the work. In its symphonic form, the Prelude is a study in contrasting moods cast in the traditional sonata form. The second movement, Toccata, is a quasi-improvisational fantasy rooted in the harmonic implications of the main theme which is exploited in many contrasting juxtapositions and permutations. The Passacaglia is a tranquil unfolding of the main theme as hymn-like chorale that roams the harmonic realms like a phantom seeking refuge in a time and place long forgotten. The last movement, Thema fugatum as the title implies is a complex contrapuntal texture that weaves the main theme into a rich tapestry of sound that moves in an almost supernatural way to the symphony’s conclusion.